As white leather ages, it can take on a yellowish hue. Although it is an expensive material and often regarded as extremely delicate, leather is capable of being cleaned with proper treatment. It can withstand tough cleaning products, but you must purchase cleaning materials specific to the type of leather you own, or use the gentler, all-purpose cleaning agent (soap and water) along with oils and polishes. Cleaning products that work on your shoes or purses may not work on your couch. So unless you are buying a cleaning agent suitable for all leathers, be sure to check that your product will work with your specific leather. Gentle hand soap with some water and a towel is a good combination for cleaning leather, specialists at howtocleanthings.com report. 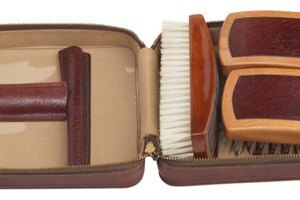 It is often used on couches but can be applied to a variety of leathers because of the soap's gentle nature. Use a rag to dab soap onto the leather and rub gently until the yellow stain disappears. Use a dry rag to remove any excess soap or dirt particles from a jacket before allowing leather to dry completely. Do not apply excessive liquid to the leather because it may cause discoloring. Test the soap and water on a part of the leather not visible on the outside. If after drying the spot remains, do not proceed with additional treatment. Using oil or polish to protect the leather can increase the life expectancy of the material. By using just a small amount, the leather will maintain its shine and durability without resulting in cracking or yellowing.